Open area workspaces are a feature in many modern offices, but what do you do with all of your under-desk action? Keep cords, cables, and attachments out of sight and your desk setup looking tidy with the UPLIFT Desk Modesty Panel with Wire Management system. Available in several sizes to fit with our standing desks, simply attach to the back or side of your workstation for an instant way to hide the things you don't want to see for a more organized look the whole office will appreciate. The UPLIFT Desk Modesty Panel with Wire Management comes in five sizes; 29.5, 41.5, 47.5, 59.5, and 71.5-inch wide panels to match your UPLIFT Desk. Our 29.5" modesty panels can be used on the side of your desk for additional privacy or as wire and cable management! Partial modesty panels are 41.5 inches wide and feature a perfect blend of wire management and partial coverage for the things under your desk. Is the Modesty Panel with Wire Management a good replacement for the Advanced Wire Management Kit? While the wire management built into the Modesty Panel with Wire Management does provide a great way to conceal wires, the UPLIFT Desk Advanced Wire Management Kit is a much more comprehensive option to organize the wires under your desk. If you are simply looking for a wire organization solution, you may be happier with the Advanced Wire Management Kit. If you are looking for both a way to organize the underside of your desk and provide some modesty, then the Modesty Panel with Wire Management is the way to go. The Modesty Panel with Wire Management will have two or three brackets, depending on size of the panel, that attach to the desktop with regular wood screws. What does the Modesty Panel with Wire Management do? The UPLIFT Desk Modesty Panel with Wire Management serves two purposes; it conceals a user's legs if their desk is facing into the room and it provides a sleeve for wire management. How does this panel provide wire management? The Modesty Panel with Wire Management has mesh pockets where you are able to organize and contain wires under your desk. 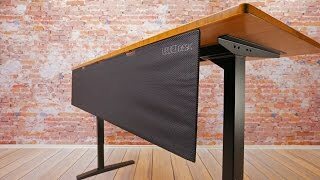 Can I use a Modesty Panel with Wire Management on the same desk as my UPLIFT Desk Monitor Arm? Yes, you will definitely have space for both on your UPLIFT Desk. We recommend that you install the modesty panel a few inches from the back of your desktop so that you have room to attach your monitor arm, if using a clamp mount. If the modesty panel is made of mesh, is it see through? The UPLIFT Desk Modesty Panel with Wire Management is not see through; it is meant to provide privacy. It obscures the view of your legs when your desk is lowered and you are in a seated position. The UPLIFT Desk Modesty Panel with Wire Management is available in four large sizes for the back of your desk and one smaller size to enclose one or both sides of your desk. Partial modesty panels are 41.5 inches wide and come with partial under-desk coverage and wire management for sit-stand desks. 29.5in modesty panels fit on both the right and left side of your desk. I got the modesty panel for cable management only. My desk is against a white wall and all the black cables hanging of my desk looked ugly whenever it was raised. The modesty panel is mesh, so I installed it backwards to hide the cables from my view. It works very well and looks great! There is some room for improvement with the design of this product. First, the mesh makes it possible to see the cables. Not a big deal for me, since the mesh side faces a wall, but in other situations it may help organize the cables but not completely hide them from view. The clips that hold the panel to the desk appear to be plastic. At this price, I expected metal clips that would last forever. And... although they are "clips," there is no way to attach them to the desk and then clip the panel in place. The panel must be permanently attached to the desk using the clips. And there are no pre-drilled holes for the clips--a big disappointment since there seems to be plenty of holes pre-drilled for other Desk accessories. I'm surprised they didn't include clips that would allow me to hang the panel on the desk after the clips have been installed, making it easy to remove the panel. But I've been very happy with the clean look, having all the cables stored out of sight. Also very easy to organize the cables in the panel. A nice addition to my stand-up desk! Pros: Simple and does the job. Looks great! Cons: Very expensive ($115) for what you get. Plastic parts and no way to easily remove the panel--you must unscrew the plastic clips from the desktop. $74.00 List Price: $109.00* The list price is the same as the MSRP (Manufacturer's Suggested Retail Price). It may not necessarily be the price at which the product is sold.